Whenever we think of decorating our home, a vase comes across our mind as a very important thing to get in the list. Vases are pretty objects to include in home décor which can be used only to display with its shape or you can put flowers in it to make its perfect use. In either ways, you will get the benefit of displaying a pretty vase at your house. Other than having a vase at your home, you can also use it as a decorating item for any of your parties or occasions. For example, a wedding program will need different types and sized vases if you are bringing a touch of flower in it. And if you are planning to do some crafting for these vases, DIY Pringles can vase can be a perfect project for you! Who doesn’t love Pringles? This potato chips becomes a must-have food item for any get together or hang out with friends. So eating Pringles will let you have the can and you can save these cans instead of throwing them away. For a trial, you can start with one can to do this project. You can make a beautiful vase by using this Pringles can. Can’t believe it? Check out these pictures and you will see that how a Pringles can could be turned into this rocky vase. 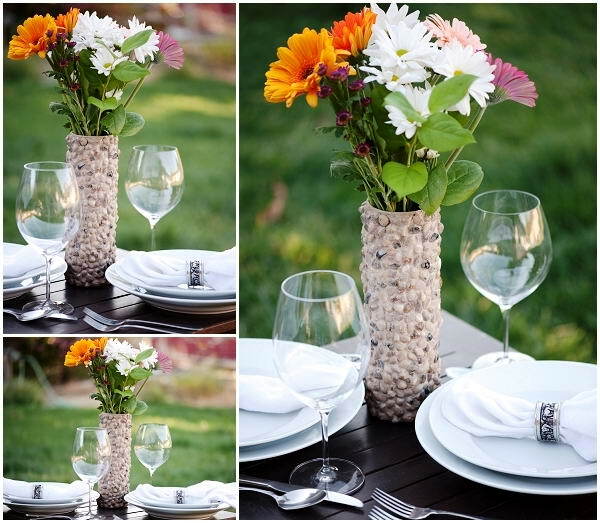 This vase will be a perfect match if you are having a sea/beach style party or a wedding. Being covered with the rocks will not give you any clue that this was once a Pringles can. 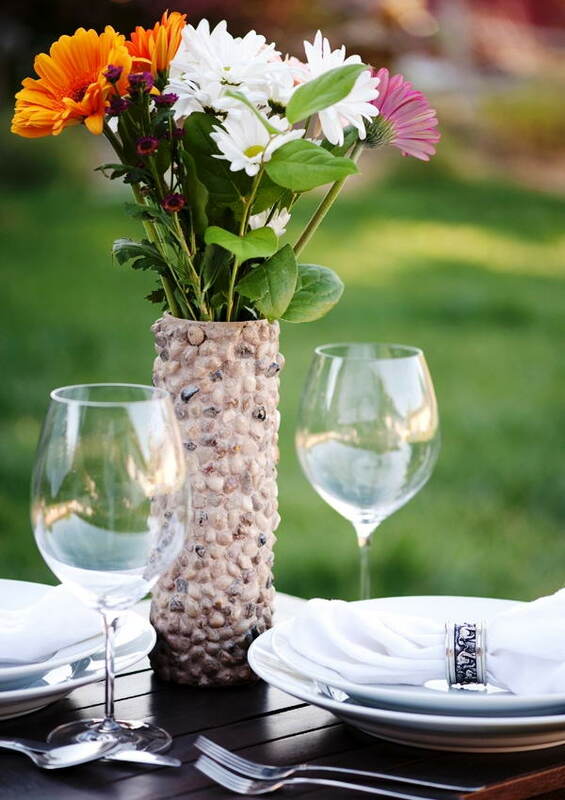 Even if you are planning to have some flower with this vase, that is also possible but make sure that you have selected the right size and type of the flowers to put in it. This cardboard-ish container will make you amazed when you will see the output of this project. 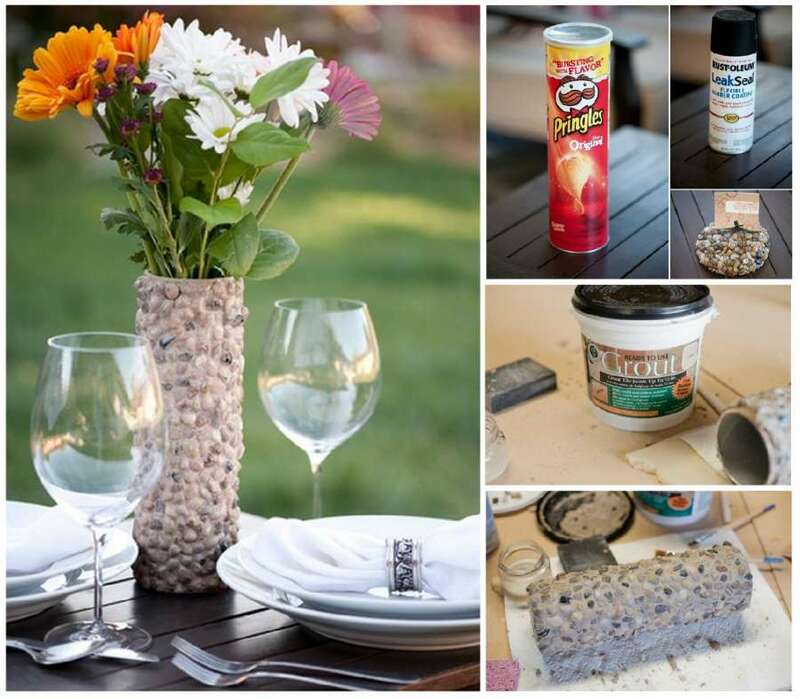 To get started, you will need a Pringles can, rocks which you can buy from craft shop or collect from the beach if you can find some symmetrical, leak seal rubber coating, grout, 3M super spray adheasive, paint brushes, sponges, water, mod podge and paper towels. It would be better to work in open space at your yard or in a workshop where you can easily use spray paint and glue adhesive. Now start with spraying the rubber seal coating inside to ensure that the water will not get leaked. Now place the can on its side so that you can spray a section of glue on it. Before the glue gets hard, start placing the rocks on the side in a pattern that you like most. 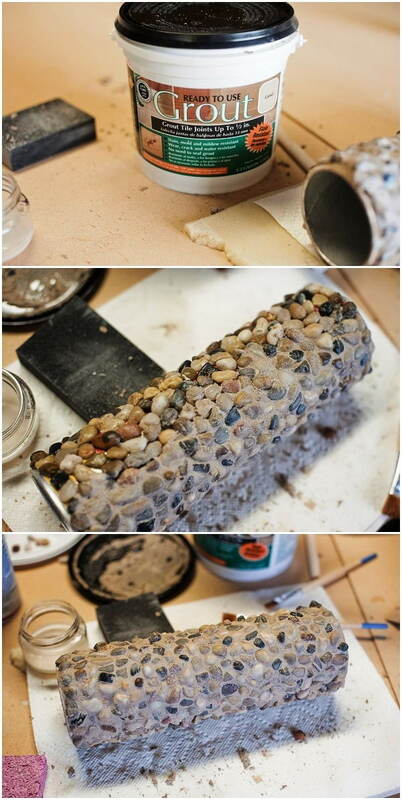 Now do the same on the other side of the can and place the rocks by attaching them to the glue. You will have to do it for the whole can and when you are done attaching the rock, let it dry for a while. When you are attaching the rocks, there is a possibility that you might not like them. So you can keep more designs such as tile rocks or any other design that you might like. This will enable you to have more designs and decide which one you want to keep for your next party. 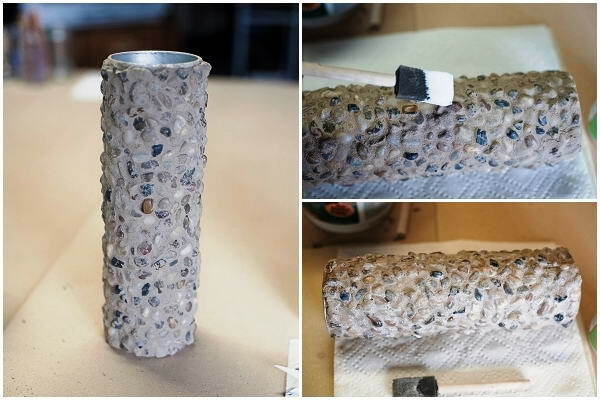 When the rocks got stuck with the can and the glue got dried, now you will have to use a knife to spread on the grout in the sections between the rocks. You can do it for the whole can and before the grout dries, you have to be very careful and apply it all over the can. You will need the paint brush to rub the grout off as much of the rocks as you can and keep pushing at the same time. This application can be done with a paper towel at first and then you can use the paint brush dipped in water followed by using a moist sponge to rub the rocks in downward. You will have to keep doing this until the whole container got grouted. Now you have to let the grout get dry and keep it aside. You can let it stay like that for a whole night and then you can give a shiny effect on the grouted rocks by applying more mod podge on them. 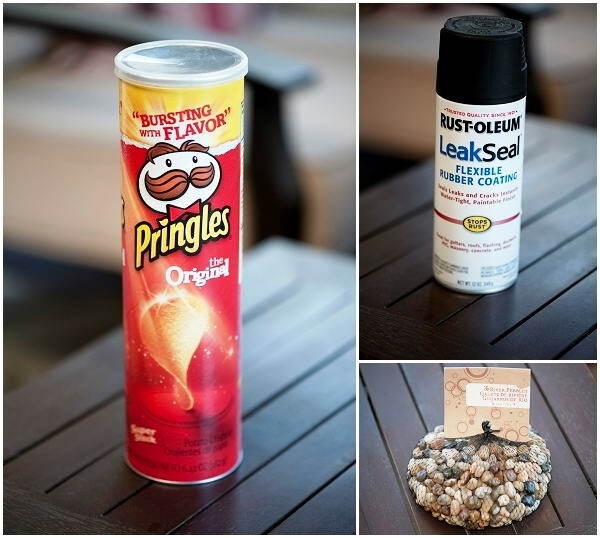 Let the mod podge dry for a while and your diy Pringles can vase is ready! All you have to do is fill the container with water and put your favorite flowers in it. This vase is pretty and amazing isn’t it? So when are you make one for yourself?